Chestnut St., between 3rd and 4th Sts. at Independence National Historical Park. In 1785, Benjamin Franklin, now eighty-one, returned to Philadelphia after many years spent in France. As applauded in his home state as he had been in Paris, he was soon elected President of the state's unicameral legislature. (He served a three-year term from 1786 to 1789.) Although the post was largely nominal - the president simply presided over the assembly -the election demonstrated the affection and respect in which his fellow Pennsylvanians held the oldest prominent revolutionary. The history of our Revolution, will be one continual lie from one end to the other. The essence of the whole will be that Dr. Franklin's electrical rod smote the earth and out sprang General Washington, fully clothed and on his horse. Franklin then proceeded to electrify them with his rod and thence forward these three - Franklin, Washington, and the horse - conducted all the policy, negotiations and war. 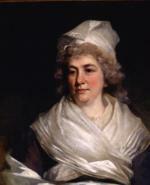 Mrs. Richard Bache (Sarah Franklin 1743-1808), by John Hoppner, 1793. Franklin crammed a great deal of public service into the last five years of his life. Most notably, he played a key role at the Constitutional Convention which met in Philadelphia during the summer of 1787. There he was the "Great Compromiser," calming down the more emotional delegates when the debate became as hot as the closed Philadelphia room in which it was conducted. (The delegates kept the windows shut to prevent an eavesdropping public from exaggerating disagreements among the delegates.) In fact, Franklin proposed - through fellow delegate James Wilson, who read his speeches for him - the "Great Compromise," proposing that the Senate represented each state equally and the House of Representative a state's population, to prevent a potentially disastrous split between the small and large states. Just before the Convention ended, Franklin urged the delegates to realize that while the final version of the Constitution satisfied nobody completely, it was the best document that could have emerged. (Franklin himself had previously advocated representation based purely on population.) The Federalists circulated Franklin's speech throughout the states and it was a potent argument for ratification. Franklin also served as president of the Pennsylvania Abolition Society, beginning in 1787, and took a strong stand against slavery even though he had been a slaveholder in the past. In February, 1789, he signed and presented the first petition to Congress to propose the complete abolition of slavery in the United States, an act that embarrassed even anti-slavery Congressmen, who did not wish to shatter the harmony with which their first session had begun. Three years later, as his final act in public life, Franklin published an anti-slavery article in the National Gazette. 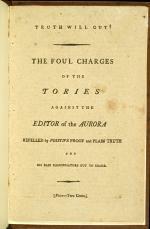 Here, he mocked the pro-slavery arguments of a Georgia congressman by assuming the persona of an advisor to the ruler of Algiers, a North African state that was capturing and enslaving Americans. Pretending to be a Muslim, Franklin claimed that slavery civilized barbarians, taught them good work habits, and imparted the true religion; all arguments used by slave owners. Congress responded by stating it had no constitutional authority over slavery in the states. Franklin left most of his substantial fortune to Sarah Bache and her children. Franklin also left £1000 to the cities of Boston and Philadelphia for the education of tradesmen, stipulating that the accumulated interest be spent 100 and 200 years after his death. The fund still exists today, supporting the Franklin Institutes in these two cities, and providing fellowships for worthy young people to attend trade school. In his final public act - opposing slavery - and his will, Franklin re-established his reputation as the most populist of the founding fathers. Both institutes were dedicated to making available to others the same opportunities for advancement he had taken as a young tradesman more than sixty years before. 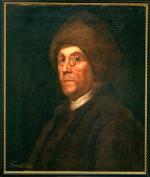 To learn more about Franklin's actions during the American Revolution, click here. 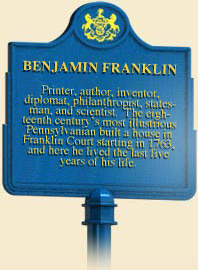 To learn more about Benjamin Franklin's accomplishments as a scientist and inventor, click here. Edmund S. Morgan, Benjamin Franklin (New Haven, Conn.: Yale University), 2002. Carl Van Doren, Benjamin Franklin (New York: Viking), 1938. Esmond Wright, Franklin of Philadelphia (Cambridge, Mass: Harvard University), 1986.